The La Sportiva Solution Women's is identical to the men's Solution apart from one key difference to make it better suited for women: thinner 3.5mm rubber is used to make these shoes more sensitive and generally more responsive for people of lighter weight - also a good option for a male who likes his Solutions extra sensitive. Embrace the pink! Aside from that, this classic bouldering shoe remains pretty much the same. 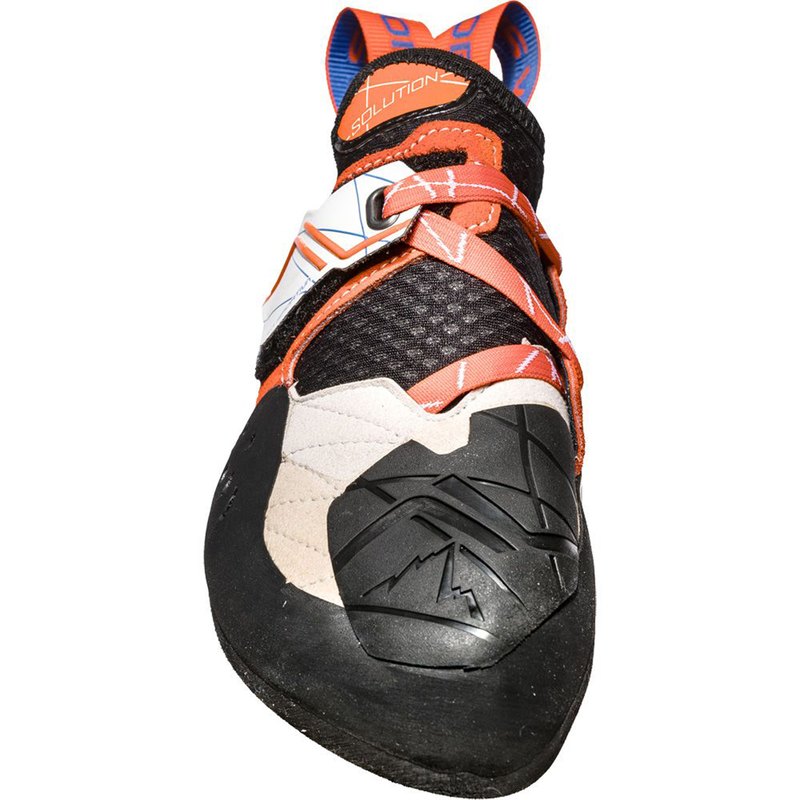 This shoe is hailed by climbers and reviewers alike as being one of the best bouldering shoes on the market. 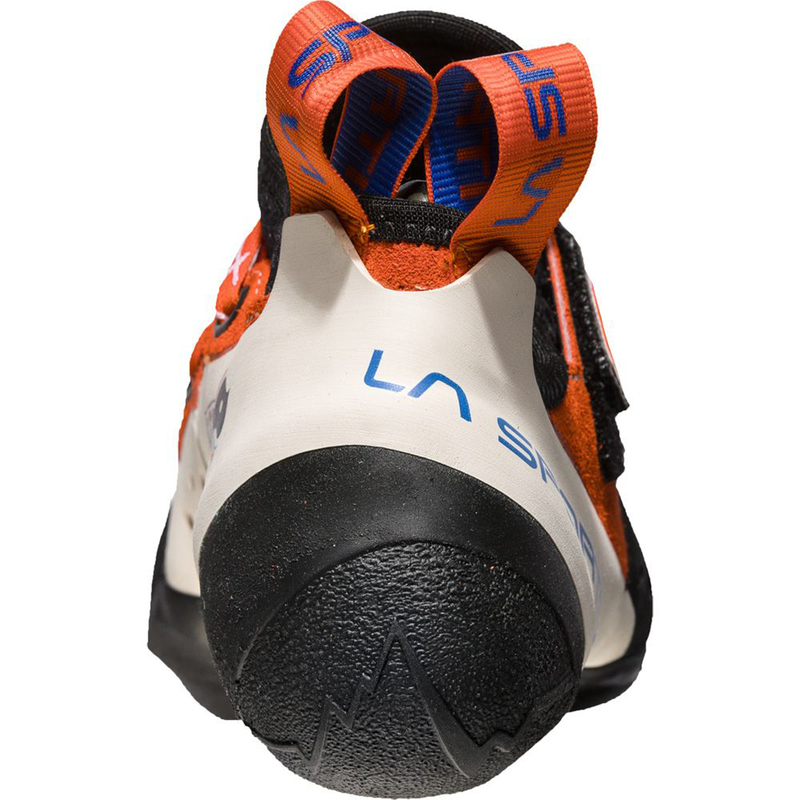 The main difference from other high-performance shoes by La Sportiva is that the Solution features a medium-stiff midsole which will provide extra support on edges and longer boulder problems. But other features include the Lock Harness System® that wraps around the heel of the foot for extra security on heel hooks and blocks, as well as the Fast Lacing System® for a secure fit that doesn't restrict the movement of the shoe. The patented P3® rand system also maintains the shoe's powerful downturned shape for longer! The Solution is lined in the toe-box and the arch area only, so expect it to stretch around half of a size. 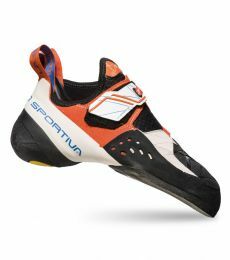 La Sportiva recommend that you fit it in the middle of tight and loose for the best performance. • Marbled P3® rands - each pair is unique! • Fast Lacing System® uses a thin, overlapping strap to provide a more comfortable and overall secure fit than one velcro strap - and it's fast! I bought the La Sportiva Solution Women’s, and I love them. The fit is tight even in the heel, and it is easy to adjust the fit due to the Velcro closure. I mainly boulder indoor and they are perfect for that. They are easy to take on and off, which is very nice in the break in period. I’m a street size 39, and chose these in a size 37½, they hurt at the start, but its gets better every time I wear them. I’m now able to climb a few routs before I have to take them off. I love that the Solution is very aggressive, I would differently recommend these. Epictv promptly told me they were out of stock and made suggestions. I ended up getting the yellow solution and love them! Stretches a bit compared to genius/futura I have, so I sized down 1/2 from those. Now comfortable enough after 4/5 sessions of climbing. Comfortable (as bouldering shoes go!) and the aggressive downturn has really improved my climbing. Great for toe and heel hooks. Velcro system helps get a good fit. Very comfortable tongue too. Highly recommend! A brilliant low volume shoe! This isnt a women only shoe - I'm a guy and in love with these. I find this shoe feels very similar to the futura due it having a thinner rubber, so its soft, but not too soft. If you cant try these on for size, try the futuras. I also find it is far more comfortable than male version. This is due to the lower volume, noticable in the heel too. The rubber is sticky as always with La Sportiva, and the closure system is brilliant - the benefits of a lace, with the speed of a velcro! The La Sportiva Women Solutions have an amazing fit if you have a low volume. Very similar to the Men version (very aggressive and great heel), but it is just lower volume, lighter and softer rubber. I must add that this shoe is not just for females. I am a guy using this shoe, mainly because my feet are not as wide for the Mens solution. I've tried testing many shoes like the Scarpa Drago, but there is alot of dead space. If you feel the same way, I would definitely advise you to get this shoe as it has a much lower volume than most shoes in the market. Would definitely recommend that people downsize this shoe. I am UK7 street size, but I am using UK 4.5 for this for a really snug fit for bouldering. 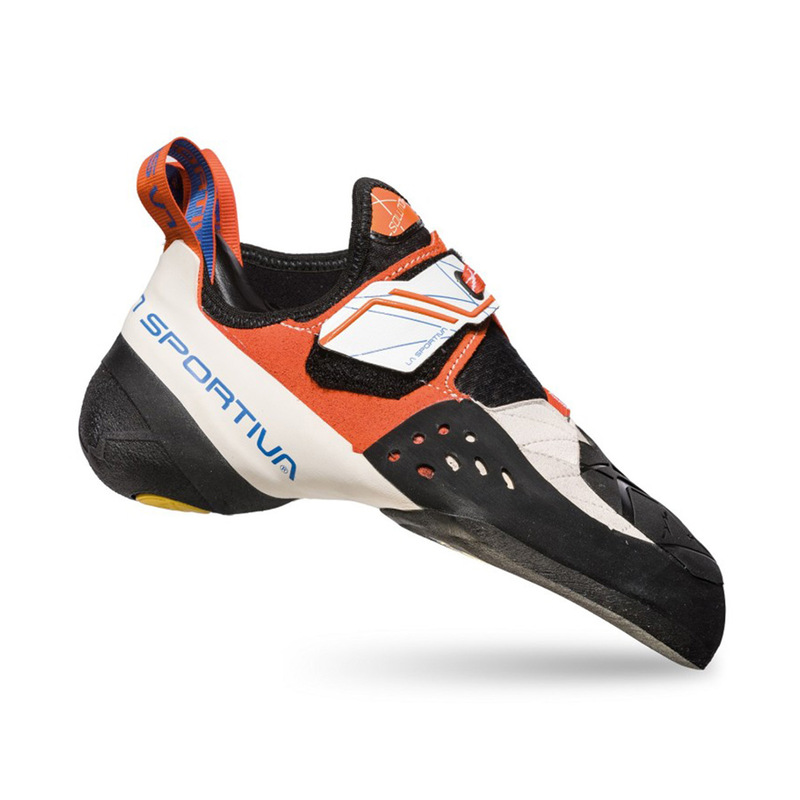 Having tried many top end shoes, including other sportiva's, five tens and evolves, I have to say that these are by far the best of the lot. I do appreciate that the same shoe can fit different people in different ways. 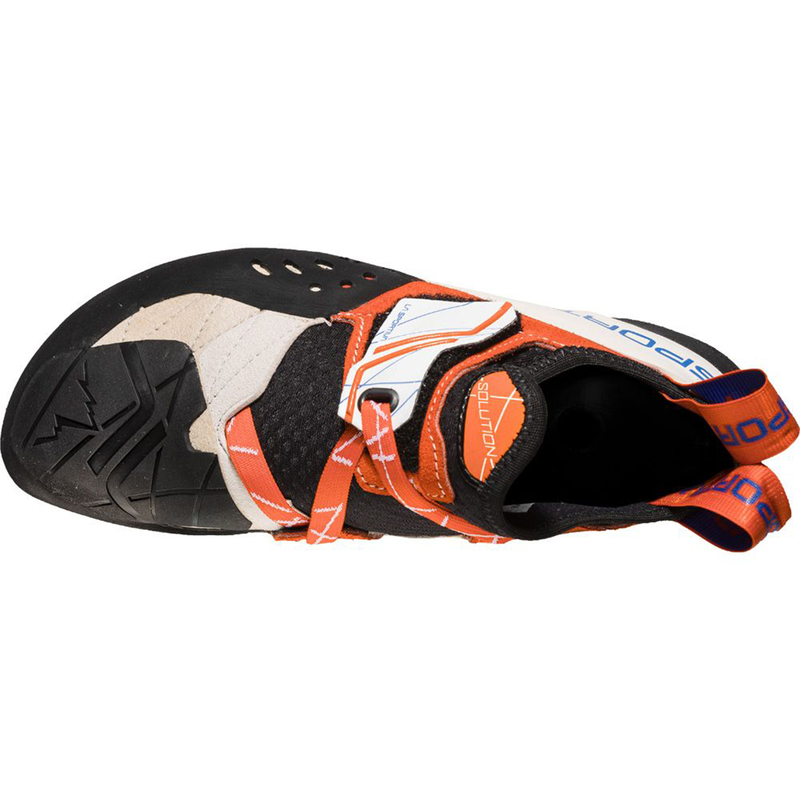 I find the womens solution fits my narrow foot perfectly, the heel is the best fitting heel I have found in a shoe and the downturned toe is perfect for bouldering and hard sport routes. Within a week of wearing these shoes they have bedded in and I have complete trust in them, but yet they never go baggy or loose their shape, even when they are ready for the bin. They really do keep their profile and shape throughout their lifespan, and fit tightly but comfortably all the time. You do need to downsize with these, I am a UK6.5 street shoe size and wear a UK5 in these. They are not the longest lasting shoe, although i do wear them 5/6 days a week, and with such sticky rubber you can't expect a huge lifespan from them. The edging on them is as good as you would expect from a top of the range brand, and I personally get a lot of feeling through these shoes. All in all I think they are a fantastic shoe, that look super cool, and I am on my 4th pair now, and don't intend to change.